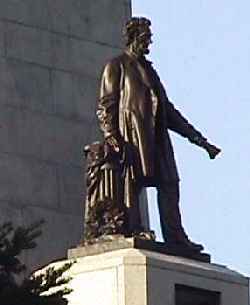 This bronze figure by the tomb's designer stands high above the main entrance, depicting Abraham Lincoln as President. One hand grasps a scroll symbolizing the Emancipation Proclamation. Lincoln's long-time friend Joshua Fry Speed, who was present at the statue's unveiling, recalled, "Shout after shout rent the air from that vast crowd; but far more touching and tender was it there, among his friends and neighbors, to see tears stream from the eyes of many."